Lip balms are a must for all of us whatever the weather it is. Applying a lip balm is certainly the most easy and handy way to heal dry and chapped lips. I have used many lip balms like Carmex, Maybelline baby lips, The Nature’s Co Chocolate Mint lip balm , Maybelline baby lips Electro Pop and many more. Nivea and covergirl are latest additions in my kitty. I love Maybelline baby lips but when using a lip balm for night I don’t want my lip balm to have any artificial color and prefer it to be in pure form. This way Nivea is definitely a winner, specially for bed time :P.
This lip balm is very moisturizing and comes in a pure form and that’s why sometimes I use it for my son too. Texture is very fine without any irritating fragrance. But it does feel little heavy on lips and when it comes to healing properties, its not as good as carmex and maybelline. But Nivea comes with the goodness of Shea butter and jojoba oil. Best way to protect your lips from all types of weather. The packaging looks cute though. The peculiar nivea – blue and white. A perfect essential for everyday lip care. Moisturises and nourishes, leaving lips soft and smooth. 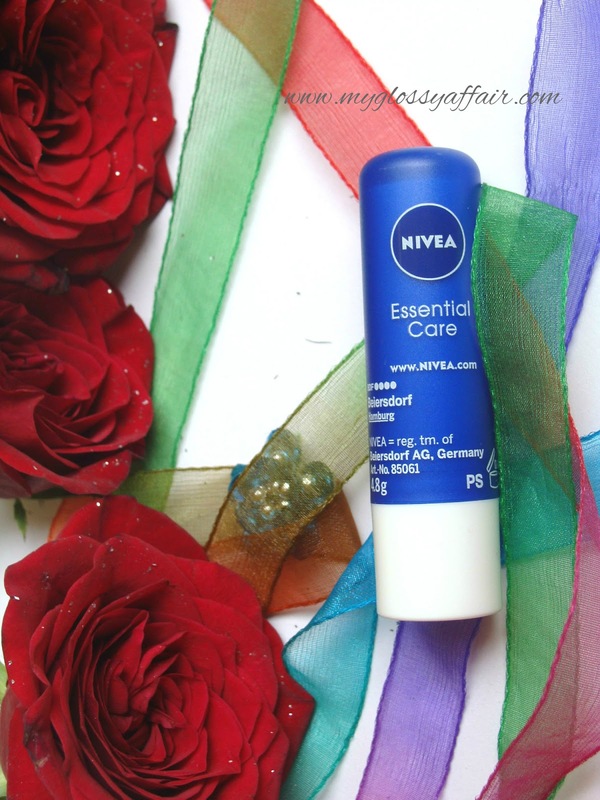 NIVEA Essential care deeply nourishes lips that always look and feel their best. With its weightless texture makes an effective all round lip care for soft and smooth lips, with no color. An innovative formula with Hydra IQ enriched with Jojobo Oil and Shea Butter, cares for your lips and prevents them from moisture loss, leaving your lips soft and smooth. Cera Microcristallina, Octyldodecanol, Hydrogenated Polydecene, Cetyl Palmitate, Ricinus Communis Seed Oil, Myristyl Myristate, VP/Hexadecene Copolymer, Cetearyl Alcohol, Polyglyceryl-3 Diisostearate, Butyrospermum Parkii Butter, Cocoglycerides, Pentaerythrityl Tetraisostearate, VP/Eicosene Copolymer, C20-40 Alkyl Stearate, Cera Carnauba, Simmondsia Chinensis Oil, Panthenol, Vitis Vinifera Seed Oil, Glycerin, Cera Alba, Aqua, Limonene, Linalool, Benzyl Benzoate, Citral, Parfum. This transparent lip balm is quite thick and feels little heavy on lips. I have also tried few other lip balms too but they don’t have this problem. Not too good. It stays for 2-3 hours and then you need to reapply. The packaging is fine with blue cap and white base. The cap is not loose and fits perfectly and is perfect for traveling or carrying around. It softens and soothes the lips. Comes with goodness of Shea butter and jojoba oil. Adds a bit of shine to lips. Little thick.The feel on lips is not too good. Doesn’t have healing properties for dry and chapped lips. All in all, I find this lip balm quite ok. I like it only because I can use it for my son and hubby. It was not that good in healing chapped and dry lips but may be it didn’t suit me and might suit you. This time Nivea didn’t meet my expectations!! Thanks for reviewing this product, I saw it and was curious about it a while ago. Have a great rest of the week! Thank you for the honest review, my dear! I think due to the advantages you mentioned this balm would not be perfect for me … Hope you are well and happy! Thanks for your honest review. I've tried Nivea products before, but I haven't tried their lip products before. a nice lipbalm is really a must, great review! Its a fantastic review !! i love nivea products but i do get chapped lips which are so severe at times so i will skip this one. This sounds decent and maybe not for the coldest weathers. Wahoo! this is an amazing product. I am too a huge fan of this product. All the pictures are amazing. Thanks for sharing. A classic Lip Balm that I really love. Nice review sweetie. It's super dry where I live so I am always looking for a good lip balm! I'll have to try this one out!